December 21st 2012-First measureable snow of the winter. A meager 0.1inches! That ends our streak of 286 days of no measureable snow! December 20th 2012-We recieved 1.22inches of much needed rain. Our yearly total is now 31.4inches. We are still short by nearly 9inches for the year. December 10th 2012-So far this winter season we have had no measurable snow. We are at 275 days since the last time we had a snowfall that could be measured. December 9th 2012-At this point we are running 10 inches behind in precipitation for the year. With only 3 weeks left in 2012 we are a lock to finish the year with a precipitation deficit. In fact if we get little or no precip in the next 3 weeks, we will finish between 20-25% below normal. August 31st 2012-90.5F today. Our 39th day over 90F in 2012. August 25th 2012-92.9F today. Our 38th day over 90F in 2012. August 24th 2012-91.6F today. Our 37th day over 90F in 2012. August 23rd 2012-90.3F. Our 36th day over 90F in 2012. August 4th 2012-95.4 Today was our 34th day over 90F this year (2012). August 3rd 2012-93.1. Today was our 33rd day over 90F this year (2012). The drought continues...As of August 1st, Peotone has had 18.84 inches of rain for the year. On average through July 31st Peotone usually has 23.62 inches of rain. This is 4.78 inches under are norm. August 2nd 2012-90.4 at 250pm. Today was our 32nd day over 90F this year (2012). July 30th 2012- 91.9F. Today was our 31st 90F+ reading of 2012! July 25th 2012- 98.9F. Today was our 30th 90F+ reading of 2012! Heat index hit 118F here in town. In 2011 we had 36 days at or above 90F for the entire year, and in 2010 we had 24 days at or above 90 for the entire year. July 23rd 2012- unexpected cloud cover seems to be helping us stay away from the predicted 99F high. As of 3pm the high so far has been 93.5F and that was back at 1pm. It is only 90F at 3pm. Today was our 29th 90F+ reading of 2012! July 18th 2012- 98.8F. This is our 28th day of 90F + heat in 2012. July 17th 2012- 99.1F. This is our 27th day of 90F + heat in 2012. July 16th 2012- 96.0F. It is the 26th 90F+ reading of 2012. July 15th 2012- 92.4F. It is the 25th 90F+ reading of 2012. July 14th 2012- 90.1F. It is the 24th 90F+ reading of 2012. July 13th 2012- 92.7F. It is the 23rd 90F+ reading of 2012. July 12th 2012- 91.1F. It is the 22nd 90F+ reading of 2012. July 09th 2012- 91.0F. It is the 21st 90F+ reading of 2012. July 07th 2012- 100.4F as of 1:20pm. This is the second highest temperature reading ever at peotoneweather.com. It is the 20th 90F+ reading of 2012. It is the first 100F+ reading of 2012. Heat index was 115F. Now at 8pm the temp is down to a cool 75F. July 06th 2012- 99.9F It is the 19th 90F+ reading of 2012. Heat index of 118F. 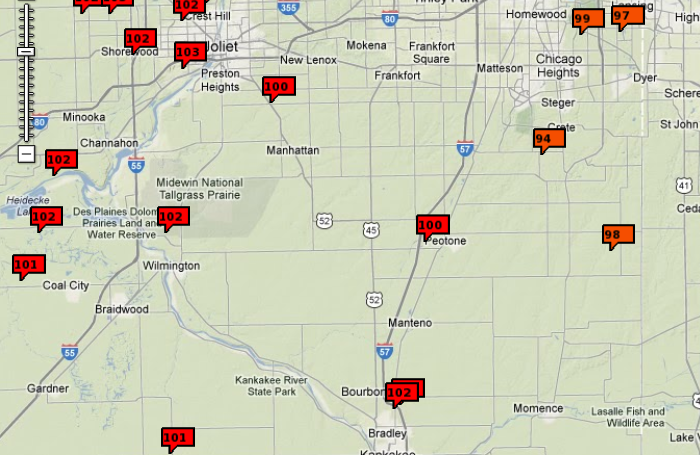 This is the highest Heat index of 2012! It is just plain HOT! The weather service rounds up So technically Peotone's high for today was 100F. See pic below for area high temps. July 05th 2012- 98.8F It is the 18th 90F+ reading of 2012. Heat index of 115F. July 04th 2012- 98.7F It is the 17th 90F+ reading of 2012. Heat index of 111F. June 29th 2012- Severe storm hits Peotone Friday 6-29-12 at 11:30pm. 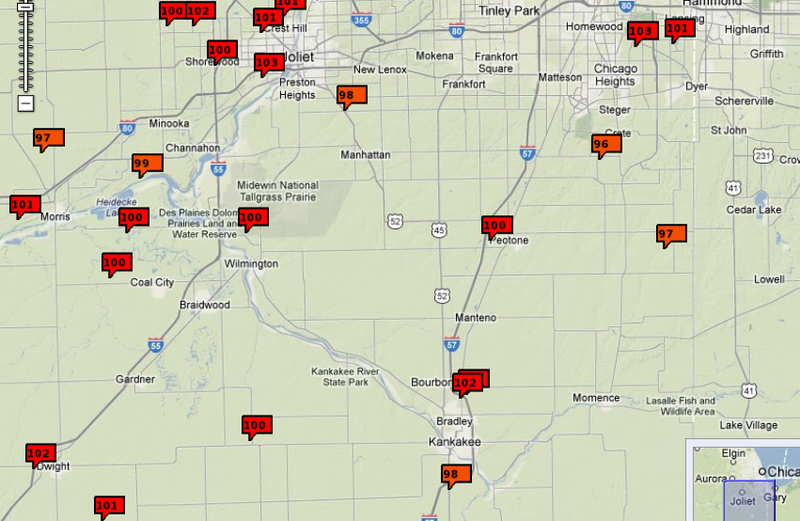 60mph wind gust recorded at 11:31pm. A small pick up truck was smashed on 1st street, just north of Main, and powerlines were down at the Will county Fair Grounds. For damage pictures click HERE! June 16th 2012- 2.57 inches of rain! 1.7 inches of the total fell in one hour between 10 and 11pm. June 10th 2012- By the end of June Peotone should be 19.47 inches of rainfall for the year. As of today June 10th Peotone is at 12.93 inches. We need 6.54 inches of rain in the next 20 days to be caught up for the year. On average June is the wettest month of the year yielding on average 5.12 inches of rain. The long range forecast does not look to good. There are spotty chances where some areas could pick up significant rain, but for the most part nothing area wide is probable, and not many chances in the next 10 days. March 22nd 2012- 83.8F record high temp for the day. In 140 years there have only been 10 days in March that have reached 80F or better. Think about that...That is over 4,300 days in the month of March over 140 years and only 10 of them reached 80F. Now we have done that not only 9 times this march, but we have done it on 9 consecutive days. This is exteemly rare!!! March 21st 2012- 86.4F record high temp for the day. March 20th 2012- 85.5F record high temp for the day. March 19th 2012- 80.1F record high temp for the day. March 18th 2012- 81.3F record high temp for the day. March 17th 2012- 82.2F record high temp for the day. March 16th 2012- 82.8F record high temp for the day. March 15th 2012- 80.7F record high temp for the day. March 14th 2012- 81.1F record high temp for the day. 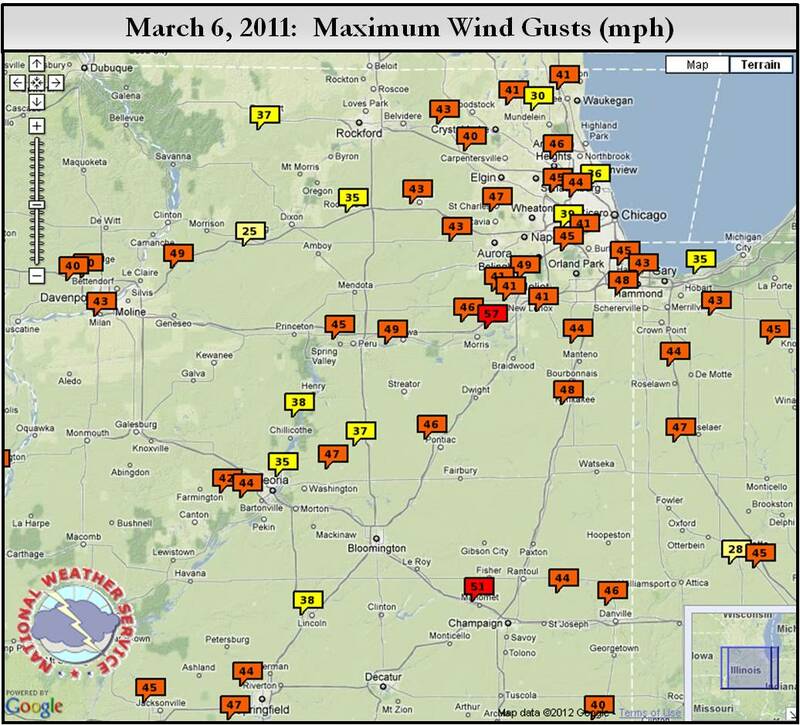 March 06th 2012- 44mph peak wind gust. Winds over 30mph most of the day. With the winds came a high temp of 68F. March 1st 2012- We finished February with only 2.2 inches of snow for the month. And 20.9 inches for the winter so far. Last winter we had 47.6 inches of snow. January 20th 2012- 7.3 inches of Snow. 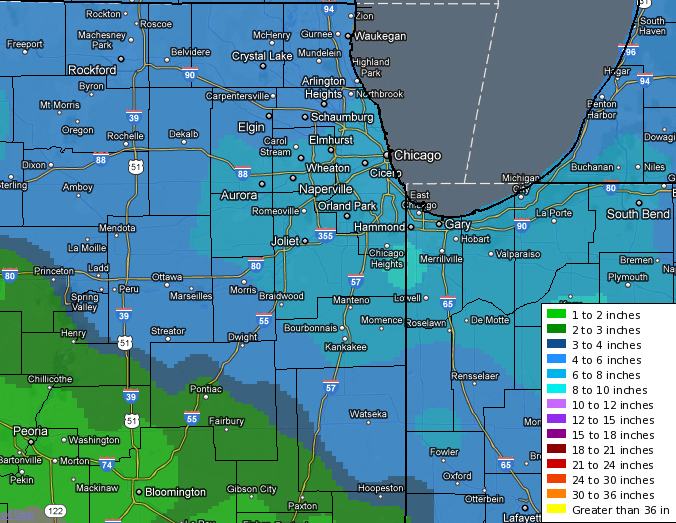 Here is a map of the snow totals from this storm accross NE Illinois. This map was provided by the National Weather Service in Chicago. January 12th 2012- 7.1 inches of Snow. Had been a mild and dry winter to this point so far. January 7th 2012- So far this winter we have had 1.8 inches of snow. In 2011 we recieved 16.7 inches through January 7th. We are 14.9 inches of snow behind last winter! January 1st 2012- In 2011 we recieved a total precipitation (rain and melted snow) of 43.73 inches. Normal precipitation for the year is 40.22 inches. We finished with a surplus of 3.51 inches.